An electric unicycle is an electric assisted vehicle. But, unlike the electronics in electric bicycle which just augment the human power and leave the steering to the rider, the electronics in the electric unicycle helps the rider to balance and stabilize in addition to giving thrust. It is much easier to learn riding on a motorized unicycle compared to a conventional unmotorized pedal unicycle. If you ever tried balancing yourself on a pedal type unicycle, you need to know that riding on an electric unicycle is a very different experience. Pretty much, the only thing they share in common is that they both have just one wheel. It is easy to learn how to self balance. In a couple of hours, you will become an expert. Traveling forward and back, and glide to either side will not be a problem. Direction steering resemble steering a conventional bicycle. You steer a bicycle by turning the handlebar with your hands. With unicycle you steer with your feet and body. Overall, unicycles are more agile and slippery than a bicycle. Some people like it. 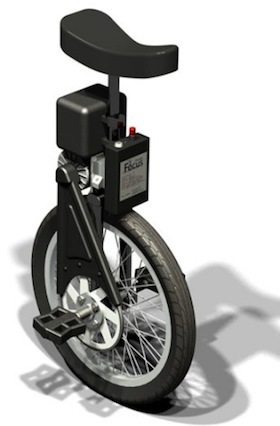 An electric unicycle has a seat mounted over a wheel just like a regular unicycle. Between them lies the electric components. There are no pedals, only foot rests and only one button exist usually, the on-off button. Some unicycles have handlebars, it makes the handling easier but kind of ruin what the unicycle is all about. The electric unicycle work very hard to always stay upright. Like the famous Segway, it has self stabilizing mechanisms. Basically, you lean your weight forward to accelerate, lean backwards to brake, and lean left or right and spin your arms to turn. You can even lean diagonally and the e-unicycle listen to you. With practice you can get more graceful and relaxed and keep your arms mostly by your side. In some systems, the steering is done by pressing on the foot rests. Using accelerometers, gyroscopes (or inclinometer) and computer algorithms programs, the e-unicycle know which way it's up to. Using that data, it balances itself. When leaning forward, the unicycle detects it and it runs the wheel forward to balance itself and keep the upright position. Same goes when leaning backwards. It does this hundreds of time per minute so the experience is totally smooth. This balancing mechanism is just what a unicycle rider does with his body, arms and legs. Does it possible to lean too much? Electric unicycles do have limits. You can't lean too much forward or backwards, there is a change you would fall. After some practice, you will sense what are this limits. You will know what are your margins of safety, and it's basically your responsibility to stay within this margins. As you can expect, the performance is pretty modest. There is not a lot of room for batteries and big motor, so the range is somewhere around 10-15 km. The speed is about 10-15 km/h. The weight is low and the rolling resistance is lower then in electric bicycle. Therefore, we get a pretty high level of acceleration for this modest specifications. 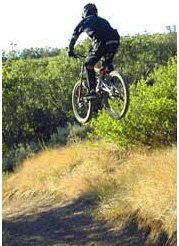 We won't want the unicycle to reach uncontrollable high speeds when going downhill. Therefore, unlike in electric bicycle, regenerative braking can serves us well. It puts energy back to the battery and slowing the unicucle at the same time. Folding electric bicycle are great option if you want to use your e-bike in combination with public transport. Electric unicycle are even better. You don't have to fold it, just carry it with you on the train, bus or put it as it is in a car's trunk. The weight is also not a problem at all and you can carry it with one hand. Most e-unicycles are still just in there concept phase. There isn't any mass production of such a vehicle. In my opinion, it would be nice to see e-unicycle which incorporate pedals. Users will have the same feeling of riding a true unicycle and also get some exercise on the way. Electric unicycles have some advantages and some inherent disadvantages like speed, safety and range. Going up-hill or down-hill is also not trivial and the applications are pretty limited. Finally, if you are thinking about building your own electric bicycle, visit DIY Electric Unicycle (Under Construction). This site deals with electric vehicles which have pedals or doesn't require license.